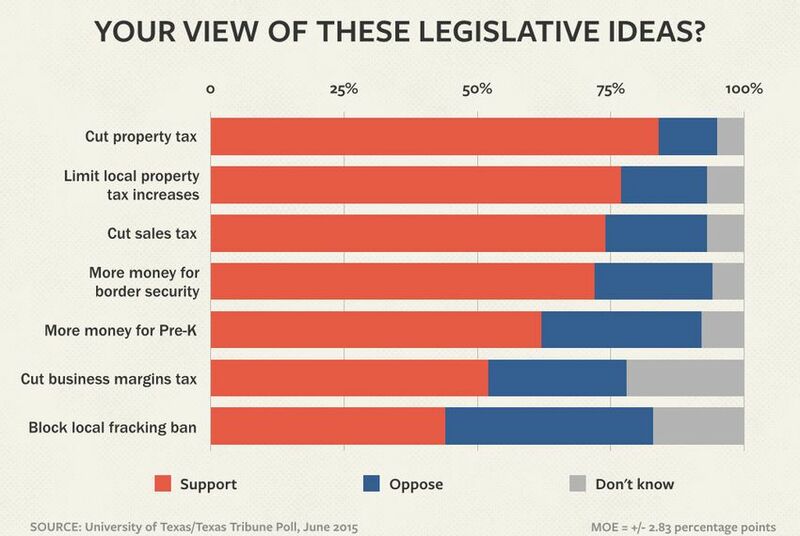 Texas voters are all for tax cuts, but not necessarily the same ones legislators prefer, according to the latest University of Texas/Texas Tribune Poll. 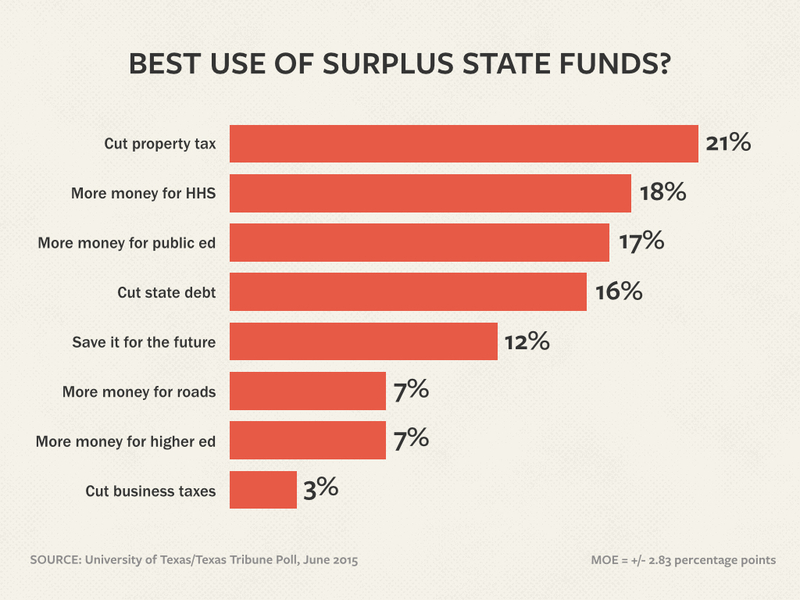 Business taxes were cut the most by Texas lawmakers this year, but cutting property and sales taxes is much more popular with Texas voters, according to the latest University of Texas/Texas Tribune Poll. Asked their thoughts on a range of tax cuts and reforms considered by the Legislature this past session, 84 percent of those polled supported property tax cuts, while only 11 percent opposed them. Limiting local governments’ ability to raise property taxes was only slightly less popular, with 77 percent in favor of that idea. Cutting business margins taxes was less popular, but still won support from 52 percent of respondents, while 26 percent said they oppose such cuts. Texas lawmakers voted to increase the size of property tax exemptions for homeowners during the session, but a majority of voters — 56 percent — said the resulting $125 average annual tax cut is not enough to make a difference. The feeling was close to universal: 63 percent of Democrats, 53 percent of Republicans and 47 percent of independents all said it was not enough. On the flip side, 25 percent of Democrats, 35 percent of Republicans and 20 percent of independents said $125 per year was enough to make a difference to the average homeowner. Lawmakers also cut the business margins tax rate by 25 percent. All told, they cut taxes by about $3.8 billion, two-thirds of the total attributed to business tax cuts and the rest to higher homestead exemptions. Two other proposals were supported by more than 70 percent of those polled: cutting sales taxes, which the Legislature did not do, and spending more on border security, which it did to the tune of $800 million. The push for more money for pre-kindergarten programs led by Gov. Greg Abbott has the support of 62 percent of voters and the opposition of another 30 percent. The same voters who liked the idea of the state putting a leash on local property tax increases were cooler to the idea of prohibiting local governments from regulating hydraulic fracturing, or fracking, within their boundaries. While 44 percent support such prohibitions, 39 percent do not. Given a choice of eight ways to use extra or surplus state funds, 21 percent of voters put cutting property taxes at the top, followed by spending more on health and human services and on public education. Reducing state debt and saving the money for future needs were next, followed by increasing spending on transportation and on higher education and, finally, on cutting business taxes. That last item was the first choice of 3 percent of the voters. Which priorities made it to the top of the list varied by group. For Republicans, cutting property taxes, reducing state debt and saving money for later topped the list. For Democrats, two items dominated: higher spending for public education and health and human services. Men preferred property tax cuts and debt reduction, while women listed spending on public education and health and human services highest. That issue preoccupied a lot of lawmakers this session, but about one voter in six registered no opinion on the issue. 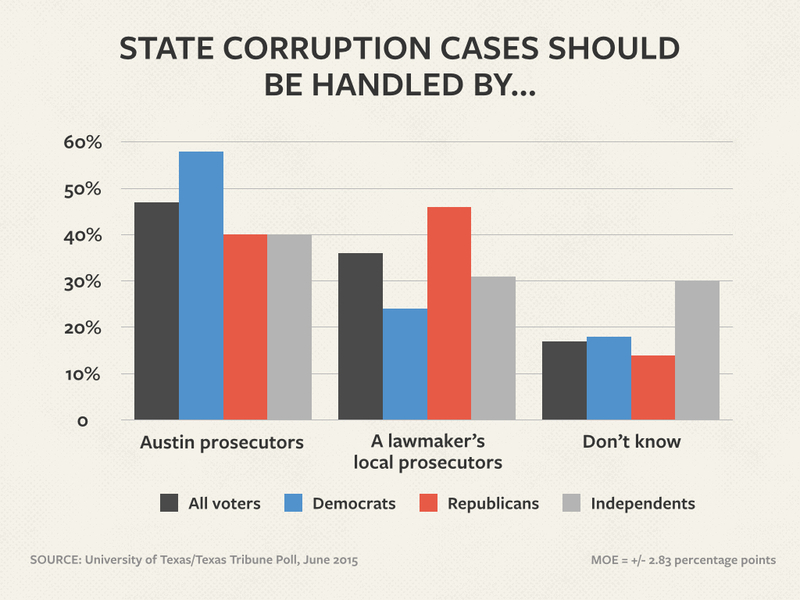 Most Democrats — 58 percent — would have left those public integrity prosecutions in the hands of the Travis County district attorney in Austin. Republicans were narrowly in favor of changing the venue: 46 percent wanted to move those cases, while 40 percent said they should remain in the state capital. The Republican viewpoint is the one that prevailed in the legislative session; future corruption prosecutions involving state officials will take place in their home counties. Asked to rate the work of the Texas Legislature, 42 percent of the respondents said they approve and 30 percent said they disapprove. One in five gave lawmakers a neutral grade. Asked generally whether the Texas government should serve as a model for other states, however, voters were more positive: 59 percent agreed with that idea, while 30 percent did not. This is one of several stories on the latest University of Texas/Texas Tribune Poll. Previously: The presidential primaries, guns and discrimination, the mood of the state, and gay marriage and other social issues. Also today: Federal interventions.